← Could navigational buoys help with Met Office forecasts? Although notable, this hot spell didn’t break any national temperature records, it was for many of the long running weather stations the hottest June day since the 1976 heatwave. One exception was that on Monday 19 June, Newport in Shropshire recorded a temperature of 30.8°C which narrowly beat the previous record of 30.7°C from 29 June 1976 in an 85 year record. The images below show how the pattern of heat altered over the course of this period. With high pressure dominating, bringing a warm south or southwesterly flow of air, heat was concentrated across southern parts of the UK, but temperatures in the north of England and Wales were in the high 20°C’s over last weekend and the early part of this week. Many sites recorded their highest June maximum temperatures since 1976 this week. However the hot spell in June 1976 remains the UK’s most significant for the month when temperatures exceeded 32°C widely across England and the current UK maximum temperature record for June was set at Mayflower Park, Southampton on 28 June when 35.6°C was recorded. The maps below show the extent and longevity of the heat over that period. The Met Office are responsible for maintaining the network of observing sites across the UK and their readings play an important first step in helping meteorologists to forecast the weather. Our weather station sites are selected to ensure that the observations are representative of the wider area around the station and not disproportionately affected by local effects. This means that weather stations in urban areas, although carefully sited to be representative of that area, will always be warmer than surrounding rural locations, but still reflect the conditions being experienced by people living and working there. The map below shows the temperature measurements which were recorded by people contributing to our Weather Observations Website (WOW) alongside the Met Office official observations on the afternoon of the 21 June. The Met Office sites recorded maximum temperatures from 32.9 °C at London, St James’ Park to 33.8 °C at Kew Gardens and 34.5 °C at London Heathrow a range of 1.6 °C. 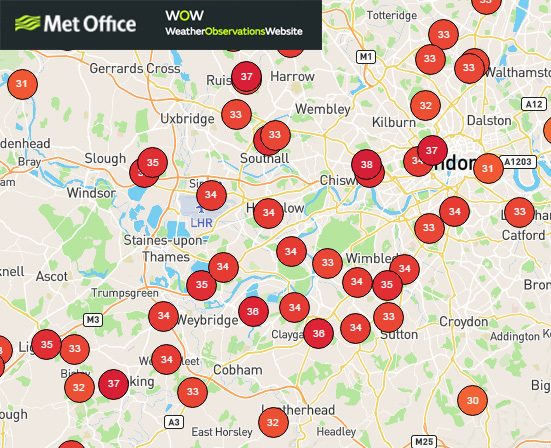 The WOW readings clearly show a much larger range and the importance of having a well-sited thermometer which isn’t in full sun or in a very sheltered location to provide observations that are representative of the wider area. However, the WOW data are very useful to add context and show that some people may experience temperatures higher or lower than the official observations around their home or workplace. If you’d like to find out more about contributing to WOW you can sign up or enter an observation here. More information about this hot spell of weather is availble on our UK climate pages. This entry was posted in Met Office News and tagged forecast, heatwave, hot weather, June temperature, June temperature record, Met Office, record breaking, summer, sunshine, temperature. Bookmark the permalink.